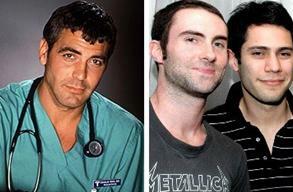 12.15.2013: Clooney vs. Levine. Please. Adam Levine is the “sexiest man alive”? Really, People? you’re killing me. 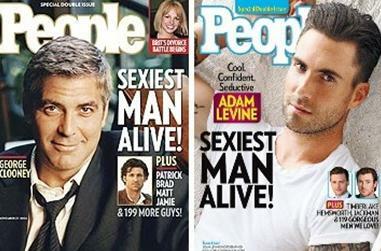 Let’s compare the 1997 winner of the highly-coveted (ahem) title, George Clooney, with the newly anointed Adam Levine. As the pics from early on in their careers clearly show, Clooney has style. Levine has a stylist. Clooney is the recipient of three Golden Globes and two Oscars honoring his body of work. Maroon 5 has had many awards for their music. As a solo (artist, model…what is he exactly?) Levin has a fragrance and a line of “fashion” at K-Mart, of all places. I smell a high polyester fabric content. Clooney has panache. Levine has pomade (‘a little dab will do ya’). People, let’s get back to being serious about this serious honor next year. Thank you.